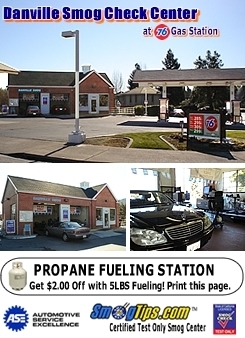 $20.00 Off Danville Smog Check Coupon - Danville Smog Check Ctr - 744 San Ramon Valley Bl., Danville, CA. Phone: (925) 743-1967. Local Danville Smog Station. Address: 744 San Ramon Valley Bl. Quick & Easy... no wait, easy access, & ample parking. With professional service, it's no question why we're Danville's favorite smog check station. ASE Certified Techs.... Our technicians are ASE certified, and trained to provide expert customer service. We're CA state authorized to inspect all vehicles requiring smog inspections by the DMV. SHOP HOURS: MON-FRI 8:00AM to 6:00PM. SAT 9:00AM to 4:00PM. Smog Special: GET $20.00 OFF when you bring in your SmogTips coupon! - Visa, M/C, Discover & AMEX accepted. More certified smog station near Danville, CA.